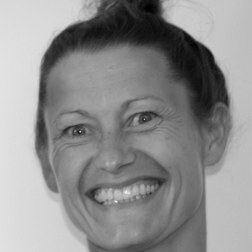 Mette Vulpius is an internationally certified Iyengar® Yoga teacher and has been practicing Iyengar® Yoga for more than 10 years. As a student of Mette’s you receive personal guidance and corrections that are very helpful in your yoga practice. Mette is very observant, and know how to take good care of everyone in the class. Mette is thorough and an active, engaging teacher, who participates in further studies here and abroad by Geeta S. Iyengar (Pune) and the senior teachers Clé Souren (Amsterdam), Manouso Manos (San Francisco) and Gloria Goldberg (San Diego) among others. Furthermore Mette has an education as a school teacher (gymnastics and sports) and has taught dance and dance improvisation.